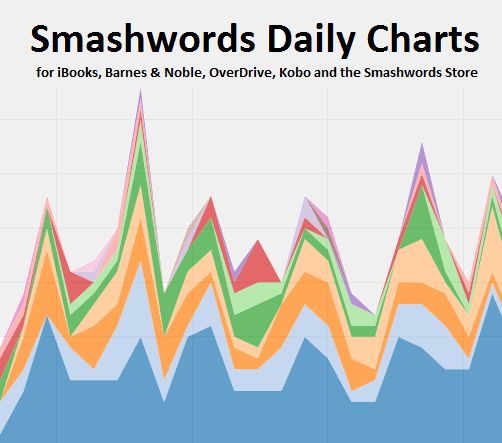 This week we released a minor but extremely useful update to our Daily Sales charts tool in your Smashwords Dashboard. You can now view your multi-retailer sales reports going back 90 days. Previously, it displayed only the last 30 days. In a couple months we'll improve it further by extending the time period to 180 days (6 months). Our daily charts provide you a wealth of useful insight to help you track the performance of multiple titles across multiple retailers. For example, you can use our daily sales reports to learn at-a-glance how readers are responding to promotional campaigns, or learn how new releases, preorder releases, price changes, free series starters, cover changes, book description updates or category updates affect the sales of your other titles. You can slice, dice and filter sales summaries by retailer, by series, and by author if you are a publisher. The reports aggregate same-day sales from the Smashwords store and Barnes & Noble, and next-day sales from iBooks, OverDrive and Kobo. This is good news. One question: why does the chart show sales, yet our balance remains at zero? Thank you. Can I use these reports to calculate my expected earnings? Not with great accuracy, so please use caution and consider these "trending" reports. The daily sales reports have not been finalized at retailers and may change before the retailer provides us final audited sales figures. Please visit the Sales and Payments Report page view your audited earnings. The daily sales reports will be ahead of the earnings report by different amounts, depending on the retailer. Also understand that sales reporting months for Apple often include the first few days of the next month, so calendar month sales may be different than sales reports." You know how we can read daily reports for up to 30 days and can download them? Can you make it so we can store those reports and download them at will. I really like these, they are excellent. I haven't used them to calculate earnings but I do like to use them to see how many books are shifting. Two nice things about this is being able to see which books resonate best with readers and at which retailers. It helps when you're trying to plan out your next book or series.